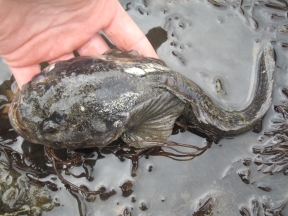 Humming toadfish are also known as plainfish midshipmen, California canary fish, or bullheads. The fish are nocturnal, and bury themselves in sand during the day, unless they're manhandled for a photograph. During mating season, male toadfish contract their swim bladder muscles to produce a low, humming sound. Female toadfish, in turn, develop increased acoustic sensitivity during the mating season, and are attracted by the humming sound. 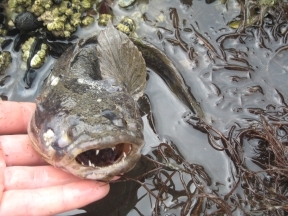 The toadfish hum can last for up to an hour, and is loud enough to be heard by oyster pickers and other humans. Midshipman fish also have light-producing photophores, which they use to attract prey. Someone once thought that the photophores look like buttons on a naval uniform, hence the name "midshipman fish." 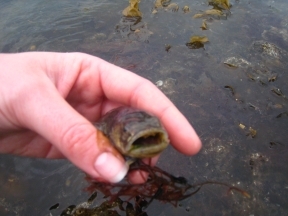 Here's a midshipman's fish looking a little happier.